2016 was a year to forget for Max Kruse. Since the turn of the year though, Bremen’s star striker has been treading a road to redemption that has not only seen him produce the best form of his career, but also put him in contention for a return to the national team set-up. 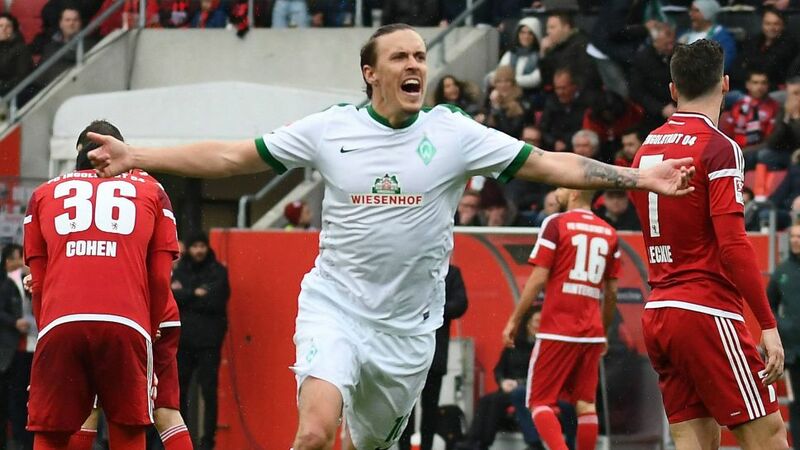 Max Kruse racked up 23 points in Official Fantasy Bundesliga on Matchday 30, but how did your team do? Unsurprisingly Werder Bremen’s 10-game unbeaten run has coincided with Kruse’s prolific purple patch that has seen him have a hand in 13 goals in just nine appearances – including a stunning four-goal haul in the win in Ingolstadt. Only Dortmund’s Pierre-Emerick Aubameyang had achieved that feat this season, while you have to go back to 1986 for the last time a Bremen player managed it. Now just two points adrift of the top six having been in the bottom three as recently as Matchday 21, Bremen have undergone a remarkable transformation. However, Kruse’s own redemption story is perhaps even more spectacular. The Reinbek native found himself in hot water early last year as a spate of self-inflicted off the field incidents plagued his final few months with Wolfsburg. His poker prowess is well documented, while his tendency to over-indulge in Nutella was publicly criticised by Wolfsburg’s sporting director at the time Klaus Allofs. Like the Bundesliga's official Facebook page! The result was a noticeable dip in form that saw him fall out of favour with the Wolves, whilst costing him his place in the national team set-up. Therefore, it came as little surprise that Kruse sought pastures new in the summer and Bremen, his childhood club, was the logical choice amongst the myriad of suitors. Werder was where Kruse took his first steps towards becoming a professional footballer and, while he struggled to make his mark as a youngster under legendary head coach Thomas Schaaf, his journeyman career has ultimately shaped him as a player. His time at St. Pauli saw him benefit from invaluable first-team experience, his sole season at Freiburg allowed Christian Streich to tap into his goalscoring abilities, but it was under the tutelage of Lucien Favre that Kruse truly honed the skills that saw him break into the national team. Take a look at the Bundesliga's top goalscorers in the 2016/17 campaign! At Gladbach, Kruse’s primary function was less to do with finding the back of the net and more focussed on developing tactical discipline in working between the lines and learning how to take defenders out of the game whether with his passes or his movement. While things didn’t work out for Kruse at Wolfsburg, a club desperate to turn themselves into title contenders that failed to lay the necessary ground work to do so, the lessons learned from that ill-fated season have seen the 14-time international mature in a way that has allowed him to assume a leadership role at Werder. Nouri’s switch to a 3-5-2 formation has not only shored up Bremen’s problematic backline – only league leaders Bayern have conceded less often than Werder in the second half of the season – but has also allowed his side to play to Kruse’s strengths as the focal point of their play in transition. The Green-Whites have picked up 32 points in 19 games with Kruse in action, an average that would have sufficed for a fourth-place finish last season and calls for him to return to the national team set-up are gaining traction. Kruse’s 13-goal tally this season is a new personal best in the Bundesliga, but the fourth time in the last four seasons that he’s registered double digits. Coming into the 2016/17 campaign fans of the German national team were questioning, who could plug the gaping hole left by Bundesliga legend Miroslav Klose, but Kruse, Mario Gomez and Timo Werner have now scored 44 goals between them this season. For more Werder Bremen news click here!